Letterpress printed maps of the Oregon Country Fair and Rivers of Oregon were created in collaboration with Jim Meacham and Peter Eberhardt of McKenzie Maps. These limited edition maps were created by hand using a combination of photopolymer plates and hand-mixed inks on an old-fashioned Chandler & Price letterpress. They are printed on 100% bamboo, tree-free paper, for an environmentally-friendly impression you can see and feel! 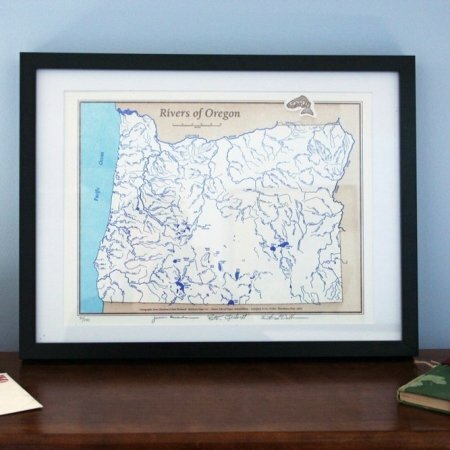 These prints would make an excellent work of art for the Oregon and/or Cartographic enthusiast. 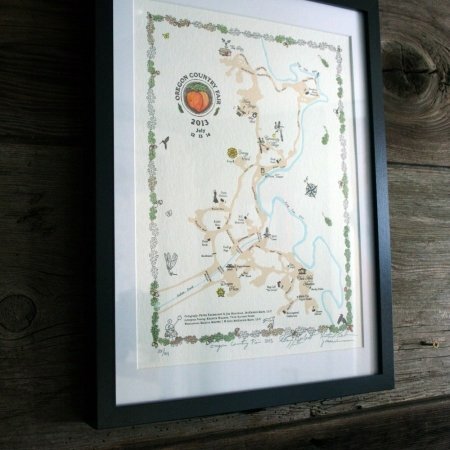 Letterpress art prints and maps can be custom designed on request. Contact Twin Ravens Press to discuss your idea for a custom letterpress map to commemorate your family heritage, ancestry, local history or event.